26 users visit the site each day, each viewing 1.20 pages. 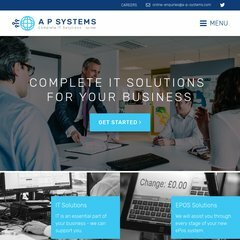 A-p-systems.com's server IP number is 213.246.108.37. There are 2 Nameservers, ns7d.teclan.net, and ns7c.teclan.net. It is hosted by Namesco Bmk Dedicated Hosting (England, Worcester,) using Apache web server. A ping speed test response, is timed at 99.2 ms.